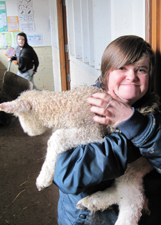 We work closely with individuals and other organisations to provide Supported Volunteer Placements at the farm. We create a tailored programme to suit the individual's needs and care plan. This usually includes one-to-one support provided by the referring organisation. Supported Volunteer Placements offer a fantastic way of providing formal and informal social interactions and a healthy outdoors experience in a friendly and safe environment. We have observed how much of an impact this can have on people's lives; improving their quality of life and happiness.